Stanley Pranin Sensei was born in 1945, is a 5th dan Aikikai, fluent in Japanese, and editor of a very popular Aikido website/magazine. He has played a massive part in recording the history and roots of aikido since 1974 through his aikido journal publication (Aiki News). His wide experience and knowledge include in-depth research into the life of aikido founder Morihei Ueshiba O'Sensei. He has documented his training in Daito-Ryu Aiki-Jujutsu and spiritual studies with Omoto Kyo. He began his Aiki News magazine in 1974 with a series of translations of Japanese newspaper articles. After having people ask for copies he decided to build a newsletter around 17 Japanese articles. Stanley Pranin was interested in Morihei Ueshiba as a person because he was such a phenomenal teacher with forward thinking ideas offering an ethical dimension regarding budo and philosophy. But there wasn't much information available anywhere, and Stanley wanted to find out more. He soon found out that the history of aikido had not been systematically recorded. 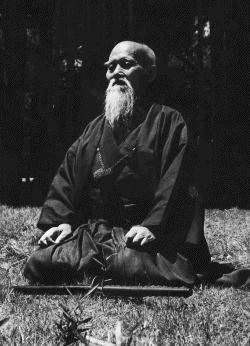 Morihei Ueshiba developed Aikido from his combat studies of Daito-ryu Aikijujutsu with Sokaku Takeda, and his spiritual studies with the Omoto Kyo and Onisaburi Deguchi. Stanley has interviewed dozens of the closest students of the founder, and gathered an amazing collection of information that is second to none. He has covered, in-depth, all of the Aiki arts and the Omoto Kyo. Stanley began his Aikido training in 1962. Received his 1st dan in 1965, 2nd dan in 1967, 3rd dan in 1973, 4th dan in 1976, and 5th dan in 1983. He taught aikido in California from 1965-1977. He founded Aiki News in 1974. He represented Northern California at inaugural International Aikido Federation congress held in Tokyo in 1976. He moved to Japan 1977 where he published Aiki News and later Aikido Journal, which is now an online magazine. He edited 'Aikido Masters' and authored 'Encyclopedia of Aikido'. He has written essays on aikido, Daito-ryu aikijujutsu and related subjects.
" OK. I'm not going to be able to take all of these documents, photographs, stories, and knowledge with me so, what is really important and how am I going to ensure that it goes beyond me and that the next generation of people interested will have the material? " This is his concern and he hopes to have the time and energy to preserve the documents in a user friengly format. visit his Aikido Journal website and subscribe for a ton of interesting information www.aikidojournal.com. I highly recommend Stanly Pranin's Journal because it accurately documents the truth about aikido history and Morihei Ueshiba O'Sensei. Unfortunately Stanley Pranin Sensei passed away in March 2017 due to a sudden illness. He leaves behind an amazing Legacy in his lifetime work for Aikido Journal... a great man! As Executive Editor, Josh Gold is responsible for the strategy of Aikido Journal and supports the teams that create the Aikido Journal’s content. He met Stanley Pranin at the Aiki Expo in 2002, and developed a strong friendship and working relationship with him. Josh began his aikido training under Haruo Matsuoka in 1991 and has been his direct disciple for 25+ years. Josh co-founded Ikazuchi Dojo in 2002, where he oversees dojo operations, supports instructors, and leads the development of Ikazuchi’s programs. Josh has many years of entrepreneurial and executive management experience. He founded start-ups and led special projects and initiatives for Intel, Sony, Disney, Nissan Motors, DreamWorks, and Formula One. Josh is always pursuing ways to elevate the martial arts through projects rooted in R&D, media, technology, and collaborations.